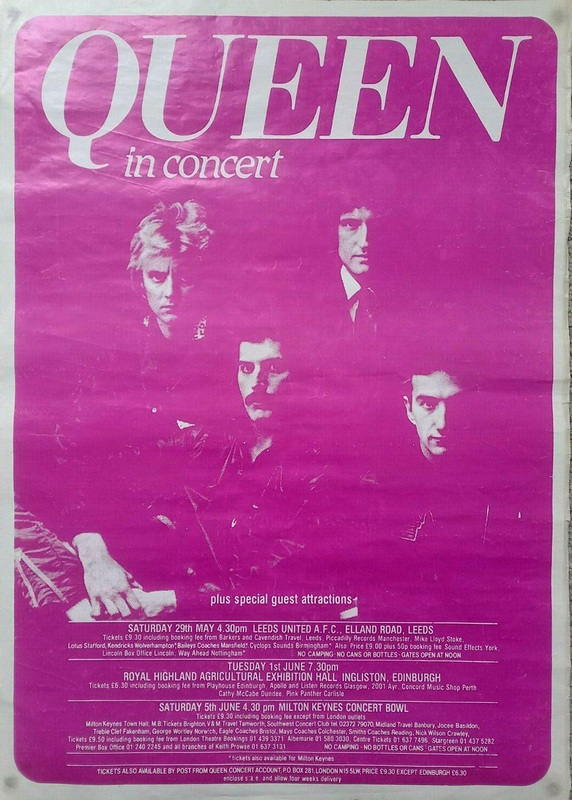 As indicated by this poster, ticket demand prompted the addition of a second night in Edinburgh. It was listed as an optional date on an early tour itinerary. Freddie sings "Cool Cat" a couple times in the Now I'm Here vocal exchange with the audience, the only time he would ever reference the song on stage. Shortly thereafter as Roger does his brief drum solo leading into Dragon Attack, like last night Freddie says "Shake", as if it were the drum solo from Keep Yourself Alive. Brian, before Love Of My Life: "Yes, I realize this is Scotland. Is this Edinburgh? This is the second night, which we've never done before here." He has seemingly forgotten about the two nights in 1976, but he gets a great cheer for his remarks, nonetheless. Freddie and Brian take many great twists and turns in the outtro of Fat Bottomed Girls. At the end of the show, Freddie says, "Thank you for two amazing days. We love ya. You're real rock and roll. See you soon, Scotland!" In fact, the band would never play in Scotland again. There are slight cuts during Love Of My Life and at the beginning of Tie Your Mother Down.